Curious what all that data in your logs actually means? Wondering how to apply it, what affects it, etc? 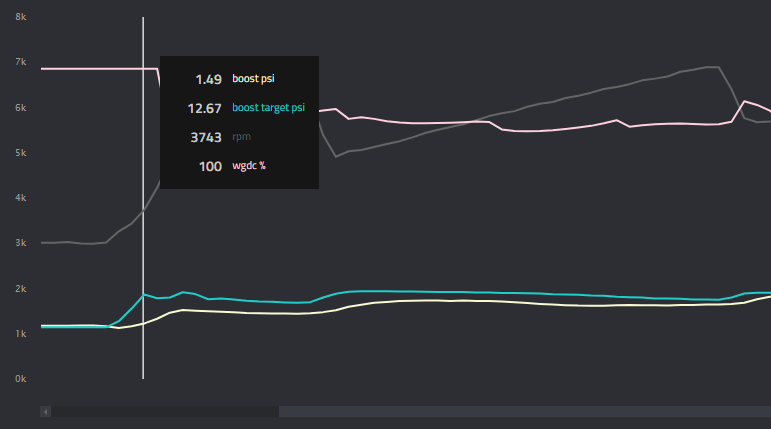 Let’s take a dive into the world of engine log reading. I’ll start with what I know how to log and hopefully continue building this post up from there. OBD adaptors used in conjunction with apps like Torque on Android allow slow data logging with limited parameters. On the N55 platform the IAT (Intake Air Temperature) is measured on the chargepipe, after it’s gone through the intercooler. When I first purchased my CTSTurbo Intake I was concerned about high IAT’s because of the design of the intake, pulling in hot air from the engine bay. After many forum posts and much research I came to the conclusion that IAT is a function of the intercooler, not the fresh air intake. The below is a full run, after a previous full run (back to back), gears 2 – 4, run at WOT. In contrast, the below .gif is from fsociety, his log with stock intercooler. In this example you see IAT’s rise very quickly as the turbo heats up and the stock FMIC just can’t keep up. It started at 78º and ended at over 123º, a change of over 45ºF! The above demonstrates our stock FMIC getting “heat soaked” and losing it’s ability to effectively cool the charge air which can result in timing pulls amoung other things. Now ignition timing is a very in depth area. There are SOO many variables when it comes to timing I can’t even begin to talk intelligently on them. What I can do though, is show you how to determine if your logs are showing you pulling timing. If your “pulling timing” you will see negative values in your “cylX timing cor *” field as shown above. Other factors for pulls in timing are IAT, weak coil(s), weak plug(s) and more but I’m going to stop there, as I said above, I don’t know enough to intelligently speak on the subject at greater length. Are you using E85 in your tank? Have you had any instances of the engine stumbling at high RPM under high load? When I used too much E85 I had this happen, it was very disconcerting and kind of dangerous. I was on a highway on-ramp trying to accel quickly to freeway speeds and the car literally had no power for about 2-3 seconds and just stumbled over itself trying to accelerate. What I’ll try to demonstrate here is how to look for signs your fuel pump can’t keep up your fueling demands. The most likely cause of this in a car with stock a fueling system is the use of too much E85. While you’re probably not going to be logging when this does happen, in the case you were here is what to look for. 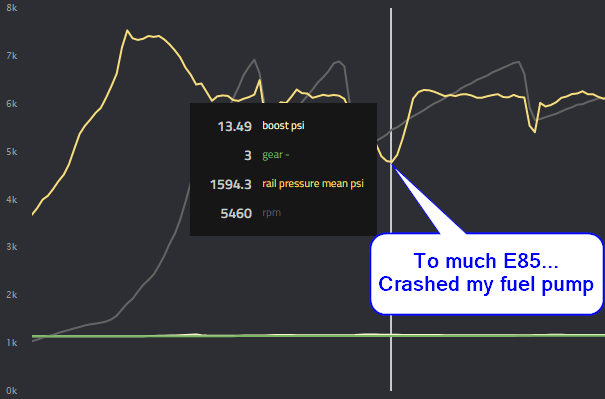 To dumb it down to my level, because I’m not the sharpest knife in the drawer… It takes much more e85 to deliver same energy as gasoline, the injectors have to inject more fuel and your fuel pump can’t keep up with that extra volume being sprayed through all the injectors, as a result your fuel rail pressure crashes. The overall PSI drops because the fuel pump is pumping as hard as it can. 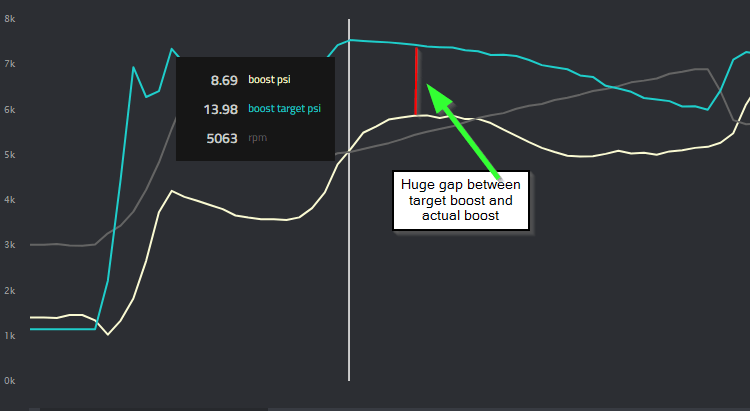 I recently asked on the forums what exactly constitutes a boost leak. I often see values 1 – 1.5 PSI below my target but not always, sometimes it’s above by about 1 – 1.5 PSI. The consensus on the forums is a boost level that consistently below by 2 PSI or greater is means for checking for a leak. Subscribe to the blog, I’ll be updating this post as I learn more! Contribute to the discussion! Am I wrong about something? Is something unclear? Let me know! Comment, contact me, find me on the forums, instagram, whatever! I just picked up this book on Amazon How to Tune and Modify Automotive Engine Management Systems. It came highly recommended on the forums, hoping I’ll learn a fair bit from it and share my experience here. Great information for a beginner like myself, this post has helped me not feel overwhelmed. Quick question, is it possible to use the MHD Data Logging license without having purchased their full OBD Flash unlocker and OTS Map? I understand it is sold separately, but will the logger still be able to grab all those parameters? I’m pretty sure you can. Your best bet would be to send a quick email to mhd.tuning@gmail.com (or facebook message) to MHD just to be sure. There logging is pretty awesome and much higher resolution (faster data rate) than any of the OBD2 loggers out there. When I started out I used an OBD2 to app on my phone and it was way to slow for any relevant data. It get’s you in the ballpark but it’s also pretty limited in terms of what parameters you can log.